This week I attended Adaptive Path's UX Intensive: Interaction Design Workshop in Chicago. I've decided to share my thoughts on the event and my set of sketchnotes on the blog. Overall it was a good experience. Dan Saffer and Kim Lenox are both very smart, talented designers who know their stuff. I gleaned good ideas for tweaking my own design process, and was affirmed in the approach and process I already follow. The Black Orchid was an OK venue. The room was relatively spacious, and the food was quite good. The tables, however, were designed for drinks while listening to jazz — not ideal for taking notes or working, and not positioned ideally for a conference. I got a bit of a cramp from sitting at an angle at my table, trying watch the speaker and take notes. UX Intensive was billed as a "workshop" even though Wednesday's Interactive Design session was actually a day-long series of lectures. Even though the topic very much interested me, by about 2pm I was having a hard time focusing, even after a second Starbucks cappuccino. I heard from Matt and Que, 2 guys I met at my table, that Monday's Design Strategy and Tuesday's Design Research sessions were true workshops, with activities and interaction between the attendees — much different than Wednesday's lectures.  Research is useless in a raw, unstructured form. It's critical to filter the information and draw insights and conclusions from your research that can be applied to the project. I liked Dan's suggestion to use physical and visual representations of research, using post-it walls and drawings on various surfaces.  Brainstorming for quantity and brainstorming in categories. Dan suggested brainstorming sprints with limited times and an emphasis on many ideas in that time. I also liked his idea of brainstorming within narrower categories, then displaying findings in a matrix or a grid.  Failure is OK. A 50% failure rate was suggested as a good thing. I've noticed that in my sketches, the more ideas I can get through the sooner I usually find a solution. Trying out ideas that may fail, lead to a good ideas, so I find this to be very true.  Good designers make better guesses. Intuition is important in design, and it's based on making good guesses. Dan shared principles and techniques for making better guesses and decisions.  Living Documents. Kim Lenox talked about designing for suites and platforms, suggesting the use of living documents, sharing information and innovations, consistency and that interaction designers need to think about the integration of 3 key areas: the PC, the Internet and mobile devices.  Constant Communication. Use various tools such as blogs and wikis within your team, to keep communication lines open with each other, and to capture information as living documents. 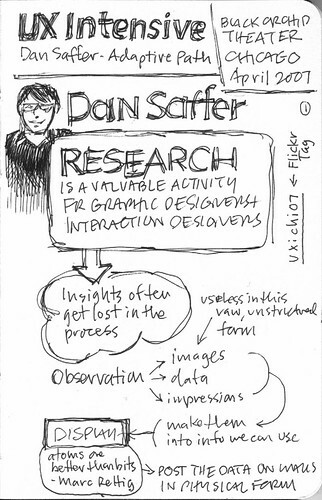 View my detailed notes in my UX Intensive sketchnotes on Flickr.  Call it a workshop only if it has workshop activities. I came expecting interaction and activities with my design colleagues and instead got a day of lectures. Workshop activities would have broken up the time, made it easier for me to focus on the ideas and apply them practically.  Add more breaks. We had breaks for lunch and for the morning and afternoon sessions, which were great. However, because of the day-long lecture format, by the afternoon I needed mini breaks in-between the individual sessions. By about 2pm I was losing focus on the topics that a few mini-breaks may have helped with.  Show more real-world examples. We had some nice examples in the lectures by Dan and Kim, but I wanted to see more of them to illustrate the concepts presented. Having more examples might also have helped my focus in the afternoon.  Go narrower and deeper. I think reducing quantity of material covered and focusing on deeper real-world examples, discussions on those ideas and workshop activities might improve the relevance of the information to attendees. So much info was presented, that I couldn't adequately digest, discuss or apply with those ideas to my own design practices. I hope these thoughts are helpful to fellow designers, and might be useful to Adaptive Path in tuning and perfecting their UX Intensive series in Amsterdam in June. Many thanks to MakaluMedia (my employer), for sending me to the event. Thanks for the advise -- we really appreciate it. I'm happy to offer the feedback Bryan. If you have any further questions or details from me, don't hestiate to drop me a line directly.